^ Examples of such cities were Lemgo (county of Lippe), Gütersloh (county of Bentheim) and Emden (county of East Frisia). ^ a b c d e f g Holland, Arthur William (1911). "Imperial Cities or Towns" . In Chisholm, Hugh. Encyclopædia Britannica. 14 (11th ed.). Cambridge University Press. p. 342. Augsburg (German pronunciation: [ˈaʊ̯ksbʊʁk] (listen); Austro-Bavarian: Augschburg) is a city in Swabia, Bavaria, Germany. It is a university town and regional seat of the Regierungsbezirk Schwaben. Augsburg is an urban district and home to the institutions of the Landkreis Augsburg. It is the third-largest city in Bavaria (after Munich and Nuremberg) with a population of 300,000 inhabitants, with 885,000 in its metropolitan area.After Neuss and Trier, Augsburg is Germany's third oldest city, founded in 15 BC by the Romans as Augusta Vindelicorum, named after the Roman emperor Augustus. It was a Free Imperial City from 1276 to 1803 and the home of the patrician Fugger and Welser families that dominated European banking in the 16th century. The city played a leading role in the Reformation as the site of the 1530 Augsburg Confession and 1555 Peace of Augsburg. The Fuggerei, the oldest social housing complex in the world, was founded in 1513 by Jakob Fugger. Bad Buchau (German pronunciation: [ˌbaːt ˈbʊːxaʊ̯] (listen)) (formerly Buchau) is a small town in the district of Biberach, Baden-Württemberg, Germany with about 4,000 inhabitants. It is situated near Lake Federsee, which is separated from the town by a wide reed belt. Bad Buchau incorporates the nine villages of Allmannsweiler, Dürnau, Kanzach, Betzenweiler, Moosburg, Alleshausen, Seekirch, Tiefenbach, and Oggelshausen, as well as the outlying farm settlements of Ottobeurer Hof, Bruckhof, and Henauhof. Also part of Bad Buchau is the formerly independent district of Kappel. The official language is German, with day-to-day conversations by the majority of its inhabitants in the Swabian dialect. From the 13th century to the mediatisation of 1803, Buchau had the particularity of being the seat of both an Imperial Abbey and a Free Imperial City. In terms of area, it was one of the smallest such cities and its island situation eliminated the necessity to erect city walls and towers. Buchau, however, lost its insular benefits after the water level of Lake Federsee had been lowered on two occasions. The German Confederation as the Free City of Frankfurt (Freie Stadt Frankfurt) (1815–66)Frankfurt was a major city of the Holy Roman Empire, being the seat of imperial elections since 885 and the city for imperial coronations from 1562 (previously in Free Imperial City of Aachen) until 1792. Frankfurt was declared an Imperial Free City (Reichsstadt) in 1372, making the city an entity of Imperial immediacy, meaning immediately subordinate to the Holy Roman Emperor and not to a regional ruler or a local nobleman. Due to its imperial significance, Frankfurt survived mediatisation in 1803. Following the collapse of the Holy Roman Empire in 1806, Frankfurt fell to the rule of Napoleon I, who granted the city to Karl Theodor Anton Maria von Dalberg; the city became known as the Principality of Frankfurt. The Catholic clergy Dalberg emancipated the Catholics living with the city boundary. 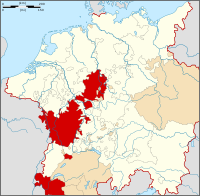 In 1810 Dalberg merged Frankfurt with the Principality of Aschaffenburg, the County of Wetzlar, Fulda, and Hanau to form the Grand Duchy of Frankfurt. After the defeat of Napoleon and the collapse of the Confederation of the Rhine, Frankfurt was returned to its pre-Napoleonic constitution via the Congress of Vienna of 1815 and became a sovereign city-state and a member of the German Confederation. During the period of the German Confederation, Frankfurt continued to be a major city. The confederation's governing body, the Bundestag (officially called the Bundesversammlung, Federal Assembly) was located in the palace of Thurn und Taxis in Frankfurt's city centre. During the Revolutions of 1848, the Frankfurt Parliament was formed in an attempt to unite the German states in a democratic manner. It was here that Prussian king, Frederick William IV refused the offer of the crown of "Little Germany". In 1866 the Kingdom of Prussia went to war with the Austrian Empire over Schleswig-Holstein, causing the Austro-Prussian War. Frankfurt, remaining loyal to the German Confederation, did not join with Prussia. Following Prussia's victory, Frankfurt was annexed by Prussia, becoming part of the newly formed province of Hesse-Nassau. The Free Imperial City of Aachen, also known in English by its French name of Aix-la-Chapelle, was a Free Imperial City and spa of the Holy Roman Empire west of Cologne and southeast of the Low Countries, in the Lower Rhenish–Westphalian Circle. The pilgrimages, the Coronation of the Holy Roman Emperor, flourishing industries and the privileges conferred by various emperors made it one of the most prosperous market towns of the Holy Roman Empire. The Free Imperial City of Besançon was a self-governing city that was part of the Holy Roman Empire. From 1184 until 1654 the City of Besançon was a free imperial city (Freie Reichsstadt) as shown by the coat of arms until today and called Bisanz. The city was first separated from the governance of the County of Burgundy in 1034 as a prince-bishopric, an ecclesiastical state in the Holy Roman Empire. The city was governed by the Prince-Archbishopric of Besançon, although later most of his power would devolve to a council within the town. The free imperial city enclosed only the city of Besançon in the Franche-Comté so for a large part of the time it was controlled those who controlled access across the surrounding land, first by the dukes of Burgundy, and then by the Habsburgs. Finally, it lost its imperial status, but remained a free city. The Imperial City of Nuremberg (German: Reichsstadt Nürnberg) was a free imperial city — independent city-state — within the Holy Roman Empire. After Nuremberg gained piecemeal independence from the Burgraviate of Nuremberg in the High Middle Ages and considerable territory from Bavaria in the Landshut War of Succession, it grew to become one of the largest and most important Imperial cities, the 'unofficial capital' of the Empire, particularly because Imperial Diets (Reichstage) and courts met at Nuremberg Castle. The Diets of Nuremberg were an important part of the administrative structure of the Empire. The Golden Bull of 1356, issued by Emperor Charles IV (reigned 1346–78), named Nuremberg as the city where newly elected kings of Germany must hold their first Imperial Diet, making Nuremberg one of the three highest cities of the Empire.The cultural flowering of Nuremberg, in the 15th and 16th centuries, made it the center of the German Renaissance. Increased trade routes elsewhere and the ravages of the major European wars of the 17th and 18th centuries caused the city to decline and incur sizeable debts, resulting in the city's absorption into the new Kingdom of Bavaria on the signing of the Confederation of the Rhine in 1806, becoming one of the many territorial casualties of the Napoleonic Wars in a period known as the German mediatisation. The Free Imperial City of Ulm was a Free Imperial City of the Holy Roman Empire. It is situated on the left bank of the Danube, in a fertile plain at the foot of the Swabian Jura. Giengen (full name: Giengen an der Brenz) is a former Free Imperial City in eastern Baden-Württemberg near the border with Bavaria in southern Germany. The town is located in the district of Heidenheim at the eastern edge of the Swabian Alb, about 30 kilometers northeast of Ulm on the Brenz River. Giengen is the hometown of the Margarete Steiff corporation, who invented the teddy bear. Positioned on the Nuremberg-Ulm-Constance route, one of the main feeder routes of the Compostella Trail, Giengen is visited each year by an increasing number of walking pilgrims on their way to Santiago de Compostella. The German city of Cologne was founded in the 1st century as the Roman Colonia Claudia Ara Agrippinensium. It was taken by the Franks in the 5th century and became an important city of Medieval Germany, the seat of an Archbishop and a Prince-Elector. As the Free Imperial City of Cologne it was one of the centers of the Hanseatic League in the early modern period. Most of the city was destroyed in the bombing of Cologne in World War II, so it was of limited importance in post-war West Germany. It had returned to its pre-war population by 1959, by which time Düsseldorf was the political center of the state of North Rhine-Westphalia, and Bonn was the (provisional) capital of the Federal Republic. In the late 20th century, Cologne grew into a center of the sprawling Rhine-Ruhr metropolitan area, with some 12 million inhabitants, just over one million of whom live in Cologne proper (as of 2012), making the city the fourth largest in Germany (after Berlin, Hamburg and Munich). Leutkirch im Allgäu is a former Free Imperial City located in south-eastern Baden-Württemberg, Germany. It is part of the district of Ravensburg, in the western Allgäu region and belongs to the administrative region (Regierungsbezirk) of Tübingen. Since the municipal reform of 1972, the consolidated Leutkirch urban area comprises the town of Leutkirch im Allgäu itself and the former municipalities of Diepoldshofen, Friesenhofen, Gebrazhofen, Herlazhofen, Hofs, Reichenhofen, Winterstetten and Wuchzenhofen. This is a list of republics. For antiquity (or later in the case of societies that did not refer to modern terminology to qualify their form of government) the assessment of whether a state organisation is a republic is based on retrospective analysis by historians and political theorists. For more recent systems of government, worldwide organisations with a broad political acceptance (such as the United Nations), can provide information on whether or not a sovereign state is referred to as a republic. Pfullendorf is a small town of about 13,000 inhabitants located 25 km (16 mi) north of Lake Constance in Baden-Württemberg, Germany. It was a Free Imperial City of the Holy Roman Empire for nearly 600 years. The town is in the district of Sigmaringen south of the Danube valley and therefore on the continental divide between the watersheds of the Rhine and the Danube. The area is known as the Linzgau. In the West, with the decline of imperial power from the 4th century onwards in the face of the barbarian invasions, sometimes Christian bishops of cities took the place of the Roman commander, made secular decisions for the city and led their own troops when necessary. Later relations between a prince-bishop and the burghers were invariably not cordial. As cities demanded charters from emperors, kings, or their prince-bishops and declared themselves independent of the secular territorial magnates, friction intensified between burghers and bishops. In the Byzantine Empire, the still autocratic Emperors passed general legal measures assigning all bishops certain rights and duties in the secular administration of their dioceses, but that was part of a caesaropapist development putting the Eastern Church in the service of the Empire, with its Ecumenical Patriarch almost reduced to the Emperor's minister of religious affairs. Reutlingen, nicknamed "The Gate to the Swabian Alb" (German: "Das Tor zur Schwäbischen Alb"), is a Landkreis (district) in the middle of Baden-Württemberg, Germany. The Treaty of Drohiczyn was concluded on 14 January 1581, during the Livonian War, between the city of Riga and the Polish-Lithuanian Commonwealth. The former Free imperial city Riga was added to Polish-Lithuanian Livonia. Its freedoms and privileges were in part confirmed in the Corpus Privilegiorum Stephanorum, but also limited. One of its burgomasters was to be appointed Burggraf, the Polish-Lithuanian official in town. Changes to the city's statutes required Royal approval. The Augsburg Confession was tolerated, but the city was deprived of the means to veto Royal interventions in its ecclesiastical affairs. Weißenburg in Bayern (formerly also Weißenburg im Nordgau) is a town in Middle Franconia, Germany. It is the capital of the district Weißenburg-Gunzenhausen. In 2010 its population was 17,513. Weißenburg was a Free Imperial City for 500 years.